We all know our schools have been drastically underfunded for the last few years. Our children are studying with outdated textbooks, computers that aren’t up-to-date and in buildings that desperately need repair. Even worse, we are losing good teachers to other states that invest more in public education than Arizona does, which is the lowest in the nation. 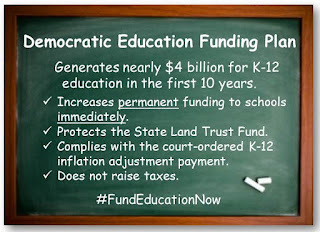 To help put our state back on track and to solve this crisis, Democrats in the legislature have released an education funding plan that will provide public schools with nearly $4 billion over the next 10 years, all without raiding funding from future generations and without increasing taxes. Unlike Gov. Ducey’s plan, the Democratic proposal protects the long-term health of the state land trust fund, which is vital to our schools’ long term funding. 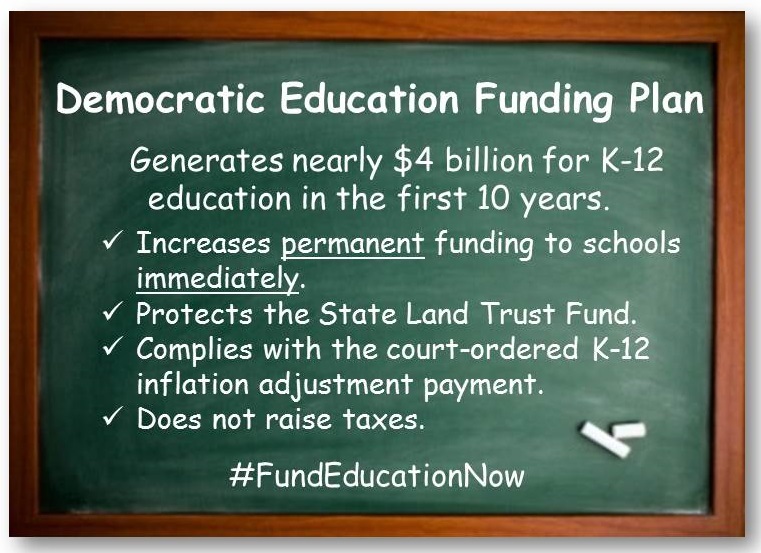 And finally, the Democratic plan puts dollars in the classroom now. Arizona has the resources to fund public education. Our plan shows that. It has always been a matter of making our students a priority. The Republican leaders in the state so far have only offered ideas that jeopardize the future of education funding. We can’t afford to waste time on gimmicks, Arizona needs a sustainable education funding plan now. Click here to see a full 10-year analysis of the Democratic education funding plan.